We can see how beautiful the light panel makes the light fall on her hair and arms. And we can see the point light reflecting in her eyes. 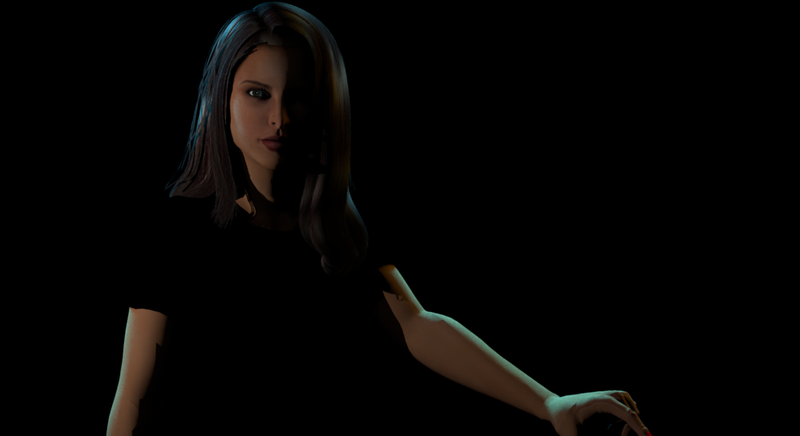 This takes lighting in SH3D to a new level. Glad to see you've found a good use for these new lights! I hope they will also be useful to others. It does indeed. Quite amazing. Congratulations and thanks, enkonyito! Without yet having had much time to experiment, it seems to me that the new light types can give softer illumination with fewer light sources, and that rendering (therefore?) will be faster. Looking forward to testing further even if I suspect I shall have to rely on examples and intructions to make full use of your work. does the renderer rely on the description field to determine the type? 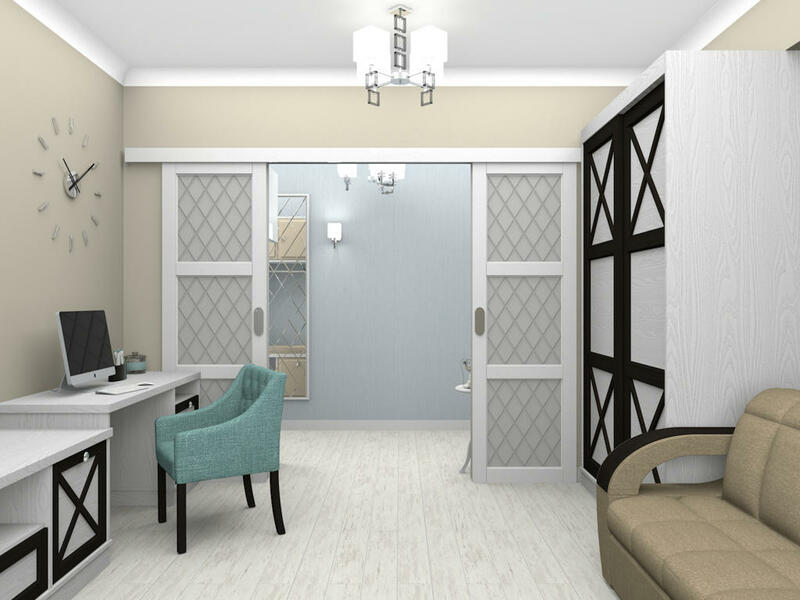 Would adding a planIcon# simplify placement of the different lights in the 2D view? Could also having a TriangleMeshLight with other colours be useful? Something closer to incandecent (lightSourceColor#2=#BB9854) maybe? This is especially true for light panels (TriangleMeshLight type) as shown in the Sunflow doc (page 54). 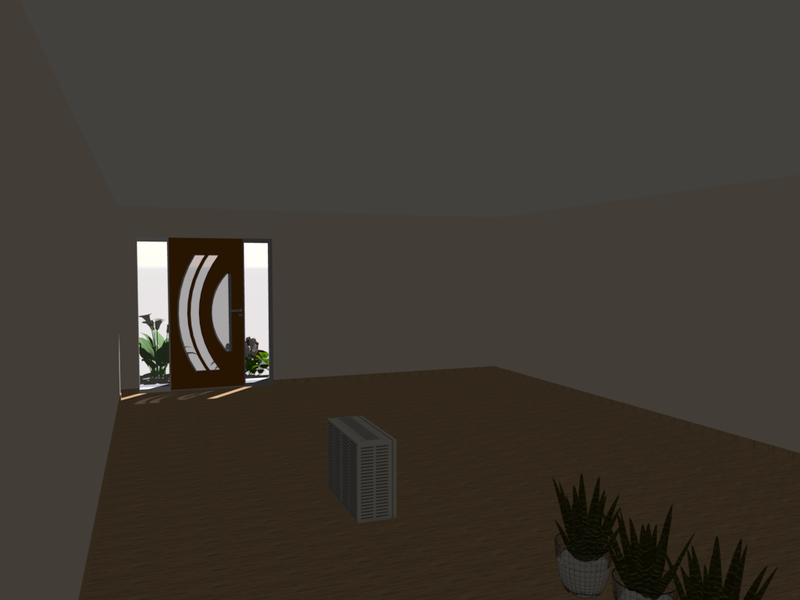 I also found it in my renderings to simulate the interior natural light. Yes, the PhotoRenderer class uses the description of the light object to differentiate types. We can then assign a type to a light we want to create. The TriangleMeshLight type is special because the coordinates of the vertices are statically encoded so the shape is limited to a single-sided panel. As it is rotating, nothing prevents to use it for an existing object. (Light panel #1: opaque when off, Light panel #2: invisible when off, Light panel #3: visible when selected and not viewable in rendering). For those I created, given their depths, it was not really necessary but if you want to add a type to the description of your lights it could be useful. The default color is daylight (lightSourceColor#2=#6D7991) but since the PhotoRenderer class retrieves the color of the object to use as a light source color, you can change it. Thanks for this. Did experiment some more, and - as you say - the light panels (TriangleMeshLight type) are especially useful for creating softer illumination. 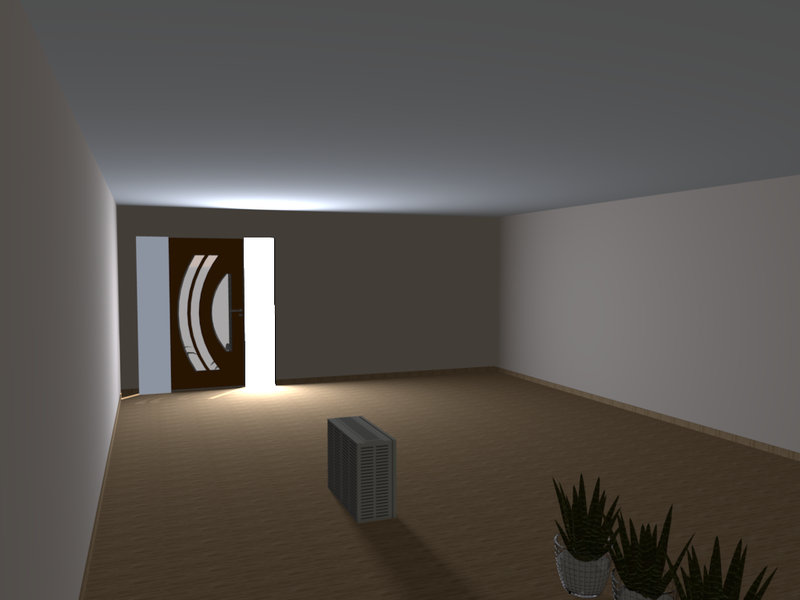 And very useful it is, as I cannot be bothered with lots of lightsources around the room to get the perfect render. With the TriangleMeshLight it is easy to shape and adjust with one or two lamps. Made one with incandescent colour, icon and planIcon. While it is true, that a planIcon does not show when the model is kept at zero depth, SH3D will let you resize also the depth, and voilà, the planIcon is visible showing the direction of the light. For now this does the trick for me. I might make a fireglow-ish one at some point (lots of fireplaces and candles here) and possibly experiment some with angles. Thanks again - very very useful set of tools. I found a solution for my opaque windows with your objects and PVR 1.5. In this first picture, light panels (in front of window) are at 0% : we see external flowers. at right of the door: a light panel is at 50%. => We don't see external objects, just light. Very good tools! They give new opportunities. Thank you! Hopefully you will be able to help me. I am struggling to use the no.3 light source with 1.5 plug in. and i have no idea what is illuminating the outer frame of the garage door. The other thing i have noticed is that if you resize or rotate the sources they appear normal in the plan, but, if you then copy / paste them they appear vertical again. If you'll pardon the pun, i hope you can shed some light on my issues, I am sure i am missing something. For the next version of the plug-in, there will be an update of the light source libraries with more explicit names. Regarding the light panels, one side emits light and they do not work with the standard photo panel. The other side is invisible. For the non-opaque light panel, the diagonal of the emitting face serves as a reference. The simplest is that you send me your file. The other thing i do not know what they're doing, but if they're going to be back to normal, but if they're going to be vertical again. I did not encounter that kind of problem.